Health care. It's a concern on everyone's minds. But when the dust settles after epic, world shattering battles, who cares for the super villains? Enter the twisted world of MEDISIN. Ethan Sharp leads a team of down on their luck doctors who have been blackmailed by the sinister Malady into providing medical care for the worst super villains in the world. Ethan and his team are all broken individuals, struggling with their own personal issues. Are they upholding their Hippocratic Oath to "first, do no harm"? They struggle with these ethical dilemmas as they strive to escape from the grasp of Malady, who has all of them on a very tight leash. Ethan comes to terms with his own family history and learns a terrifying truth about himself along the way. 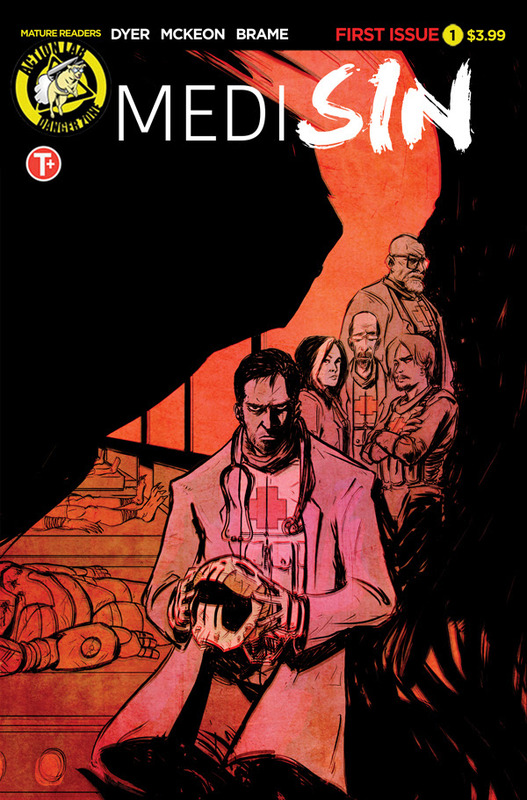 MEDISIN is a six issue mini series from Action Lab's Danger Zone. The story arc is titled "First Do No Harm" and is written by Jeff Dyer and Dr. Mark McKeon, drawn by David Brame, colored by Joaquin Peyeryra and lettered by Adam Wollet. Aimed at reader 20 years old and up, MEDISIN features a diverse cast of strong male and female characters that includes young and old, African Americans, Latinos, Asian and LGBT characters. With dark tones and intense situations, MEDISIN is sure to appeal to fans of Breaking Bad, Criminal, and Suicide Squad. Writer Jeff Dyer comments that "As a kid, I always wondered where the super villains went after a brutal battle. I mean, they couldn't just walk into a hospital because they'd be arrested, right? That's how MEDISIN was born. I think this story explores something new and features characters the readers will care about and identify with. These physicians are torn between their duty and saving lives. But which lives are worth saving? And by saving the most horrible beings imaginable, are they contributing to the evil in the world? Comics have always been about right vs wrong, good vs evil. That is at the heart of what we are exploring in MEDISIN. These characters are deeply flawed individuals who still may have a shot at redemption. But of course it comes with a cost."